Firstly a huge thank you to absolutely everyone who has taken part or trained or supported us on this CPD journey so far! We are delighted to say that we have secured the DFE funding for next academic year too and that these LNM CPD twilights will continue once per term in at the moment 8 different local venues throughout the next academic year.This is just one part of the CPD that we are offering as part of the DFE WTSA/JLN project. It's time to review last term's CPD and reflect on our success, next steps and what we can do to improve the CPD.We have now reached over 500 local North West teachers and have run local network meetings each academic term this year as well as upskilling in French and Spanish and pedagogy and cross phase CPD.Each meeting is different and the size of the audience varies, but the enthusiasm,determination and commitment is obvious! We have realised that it suits teachers and schools to have the LNM CPD if possible in the first half term of an academic term.The coordinators that attend these meetings can then go back to school and plan to share and use the resources and activities effectively in the second half term. Last term our LNM focus was "Carnival and World Book Day".Thank you so much to all the schools that hosted one of these meetings and to Jayne,Emilie,Jo and Claire for their time and effort as they learn how to be lead trainers at these events as part of our "teacher led" CPD.Thanks also to the teachers who presented at the events - to Carmelina, Capenhurst CE and Fran! As always the opportunity to network and share is popular. Below are two examples of how activities we share at the CPD has an impact on the local delivery of languages in primary.The activities we share are intended to help all colleagues focus upon the ways that they can adapt and use the ideas to deliver effective language learning back in school in line with the Learning Objectives from the DFE POS. Our carnival stretchy balloon to focus on sound spelling links proved very popular .I loved the fact that teachers at later CPD events brought their class stretchy balloons to show and share - where they had taken the original content , changed the content and created their own learning resource.Brilliant! Exactly what we hope will happen! Here is one teacher's take on this idea- based on fantastical animals! She shared this with me at our Literacy and Phonics session in March with Julie Prince .Thank you! The carnival triaramas to develop speaking and writing in full sentences were a great hit! So many of your children created their own versions!Everyone reported that the not only was the activity enjoyable but you found links with culture and primary creativity.some of you felt that the activity allowed you the chance to demonstrate and collect evidence about how the children could independently say ,write and understand purposeful target language. Here is just one example of children's own work! Teachers take away from this CPD a year's worth of language teaching and learning resources too - for themselves and also so that they can help their staff back in school to make a start or progress. The teachers at the sessions practise the spoken language with Emilie and Ana and then take sound files and pod casts back to school so they can listen to Ana and Emilie independently and revisit what we practise. 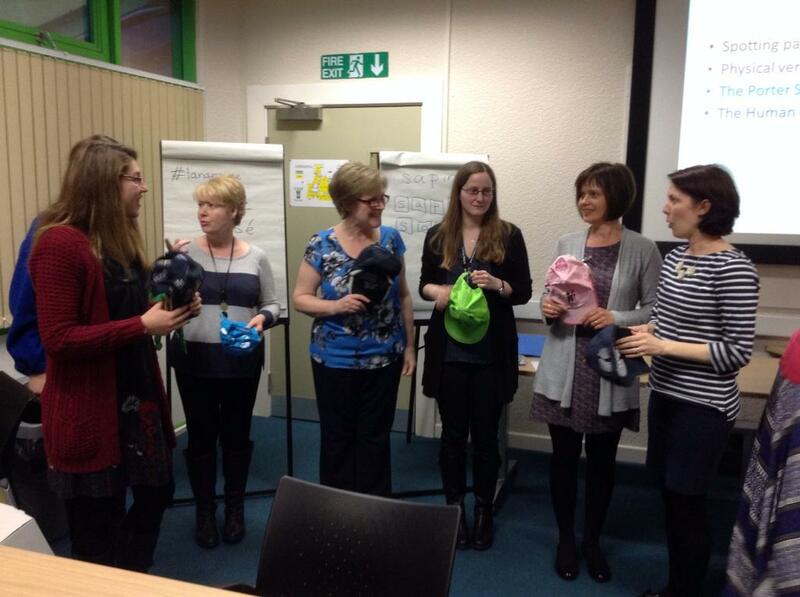 It's been a delight to watch Emilie and Ana grow in confidence as teacher CPD trainers! The response from the teachers at the Beginners French (delivered solo this time by Emilie) was overwhelmingly positive- a native speaker starting right from basics and making sure that the CPD is linked to effective primary practise! Intermediate upskilling is really rewarding as teachers go away feeling confident about their understanding,use and ways to explore in a primary context nouns, adjectives and frequently used verbs in the present tense. Below is our Cinderella and the verb "to be" dice game that we play. Making a potion with the verb to have and animals to create our wizard allows the teachers to explore how they can use a variety of content to link grammar with a primary approach! We delivered sessions in French and Spanish at intermediate level during Spring term.Here is a review of what we explore. We look forward to working with colleagues next year as we roll out the second year of Beginners and Intermediate French and Spanish.Some of our colleagues have requested conversational upskilling too! The great news is that we are now establishing a German primary sub-network too, run by one of our local colleagues,Barbara Foerster,a native German primary language teacher and teaching assistant at a local primary.Barbara has worked with us for seven years! The first informal meeting is planned for this Summer term ,so do get in touch if you would like to go along to the meeting! We want to bring KS2 and KS3 colleagues together.We have established dialogues with secindary schools and colleagues and Jo Gierl has begin to keep a record of her observations,conversations and reflections in her blog: JoBeeG73. To bring primary and secondary together we are offering CPD that we feel ,has value to both primary and secondary colleagues.In Autumn term we invited Joe Dale to share his vast knowledge of APPs and technology and how we could use this as ,a shared language learning tool between stages and ages of learners. This term we invited Julie Prince to share her vast knowledge and understanding of phonics and literacy.she helped us to look for a continuum in skills and learning activities and helped us make those links between key stages of language learning.Brilliant sessions! I say sessions because we offered either and afternoon or a twilight session to keep numbers at a level where the teachers could be really hands on and engage with the activities! 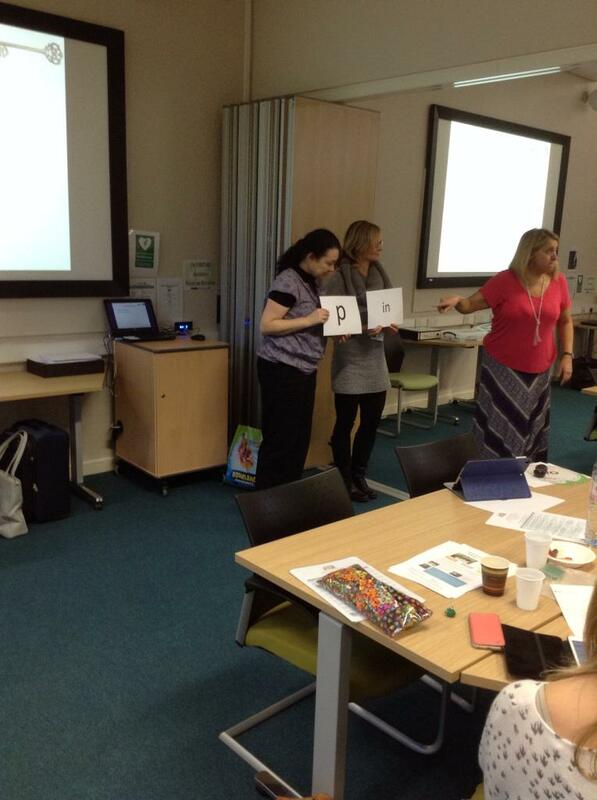 This picture shows a primary and a secondary colleague learning together! Thanks Julie! We all received training and our developing trainers and native speakers learned so much too.Can you spot Emilie and Beatriz? If you know who they are of course! This term we ran a repeat session of "Fit for Purpose and getting started with the new DFE POS". I then delivered a more in depth and "moving on" session for coordinators on progression. I have to say that I am always amazed by my teaching colleagues determination to make sure that primary language learning is effective and addresses the needs of the primary language learner.We have been working closely with our Warrington colleagues as a network since 2011 and before that as a Warrington network led by myself as a Primary Strategy Consultant.I think in total if you add in the years when I was a Primary Languages AST,it's actually over 14 years- if not more! Over the course of this time we have watched some young linguists flourish and are now in the position to be able to share how we track,collect evidence across 4 skills and assess progress.Our Ensuring Primary Progress CPD was oversubscribed and we had atleast 42 delegates in what was really a small room (sorry!). It was however a chance to consider what progress and the assessment of progress can look like in line with the new DFE POS (and without levels). It was CPD that posed and raised questions and what was wonderful was that some colleagues felt confident enough to ask difficult questions and challenge ideas! We were all learning and sharing! It's led to us setting up a small working party to look at what and how we assess work.It's also led to colleagues being able to go away and set up activities that allow schools to make a start with primary language tracking and assessment.It meant that we were able to take a look at how the DFE POS ,the CEFR, the KS2 Framework Objectives can all dove tail together to create a more comprehensive picture of progress- even if we need longer to reflect upon best ways forward in our own school settings. This CPD will be offered again next academic year and we hope to have new elements that we can offer as follow up CPD for example to feed back from the small working party or to share ways local schools have been trialing assessment as an integral part of the classroom teaching and learning. We will also be offering "Making Links Abroad CPD" a second time too! Thanks to Erzsi Culshaw, Graham Butler and Odette Hunt for making this twilight CPD so effective and informative. 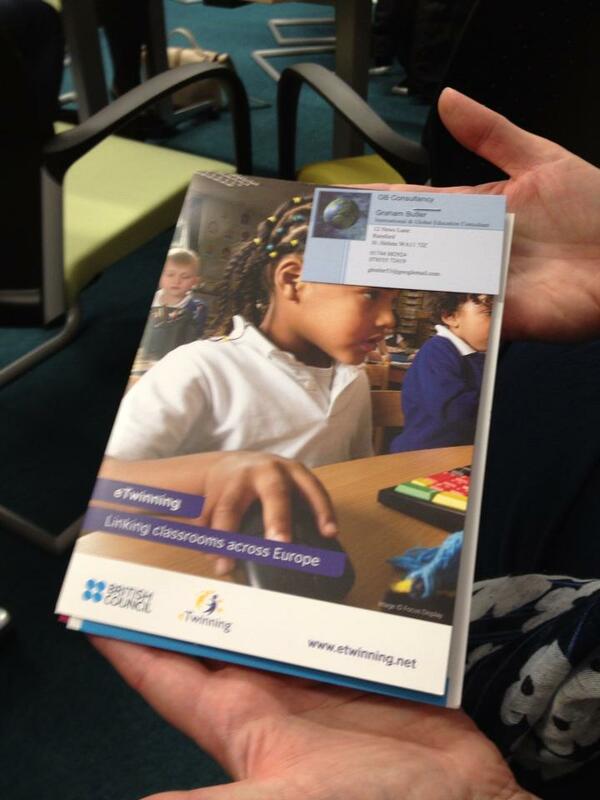 .....and ways to link classrooms and schools through funding from the British Council , through the International Schools Award, Connecting Classroom projects and global learning CPD. Thanks to Graham of course for sharing his immense knowledge! 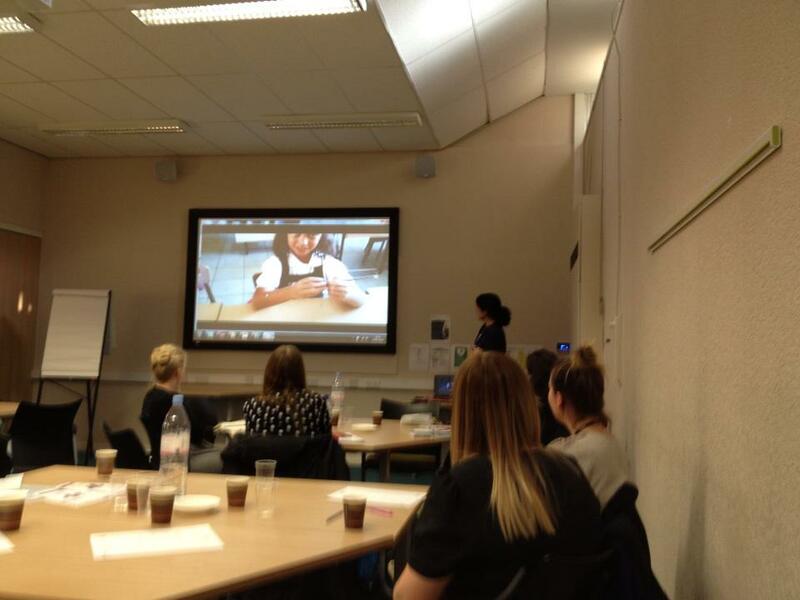 I think it's really important to share the key CPd more widely so i have been Storifying our guest speaker events. Here is the Storify report of the session Making Links Abroad. We need to keep sharing, and the network meetings will allow us to do this. We need to keep on supporting colleagues to feel more confident in their ability to deliver or reinforce a specialist teachers delivery of the target language - so we look forward to offering language upskilling next academic year. We need to keep moving forward,so the CPD in "Ensuring primary progress" and a possible follow up session for those that attended the CPD this March are both really necessary. We all need to keep learning and to keep on exploring language learning.New teacher led CPD trainers need to continue to be nurtured so that fresh approaches are shared and also the impact of projects like this are long lasting and ensure that language learning from age seven is sustainable! We need to keep primary language learning "primary" .Creative activities and outcomes appropriate to the age and stage of learner will remain a key focus of this project. We need to share our CPD and learn from others too,so links via social media- Twitter,Facebook, blog posts and You Tube are vital. We need to continue to strengthen our cross phase work.Languages need to be seen as a learning continuum from KS2 Y3 to KS3 Y9 and beyond.Content,context and skill development needs to be age and stage appropriate.To this end we need to be continue to offer discussion seminars and workshops to strengthen dialogue and "listening"/ "sharing" between KS2 and KS3 colleagues.